Back in March of 2010, we reported that the Reef Capable High Output LED from Marineland were on display at the Global Pet Expo in Orlando. We wanted to do a follow up, now that the lights are available for purchase. The Marineland Reef Capable LEDs sport both 10k white, and 460nm actinic blue 1 watt LEDs, putting out a reported 130 PAR at 12 inches. The Reef Capable LED Lighting system has an integrated heat sink. The aluminum housing pulls heat away from the LEDs, as well as your tank. The units offer 2 modes: Daytime (white and blue LEDs) and Lunar (blue LEDs only). Which 50,000 reported lifetime hours, there’s no need to continuously spend money on replacement bulbs. 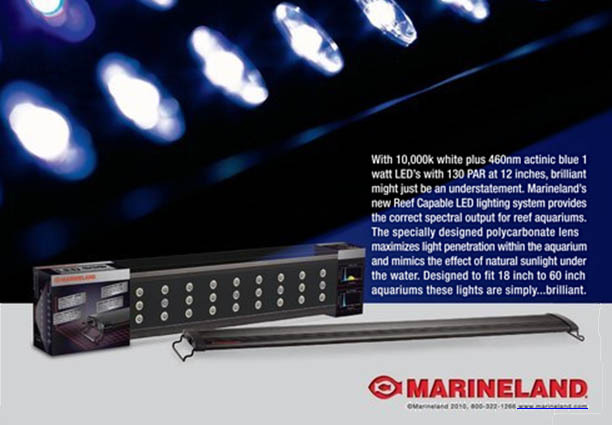 The Reef Capable LED Lighting System from Marineland is available in 18″, 23″, 26″, and 46″ models, which use a flexible mounting system to fit tanks between 18″-60″.